NEW 3-Stage Turbine! A Great Way to Spray - Just Got BETTER! Produces 7.5 psi @ 60 cfm for Superior Finishes. New SHOWTIME 99 Turbine Spray System with High-Volume 3-Stage Turbine Power Unit produces 45 to 50% more pressure than our popular SHOWTIME 90. 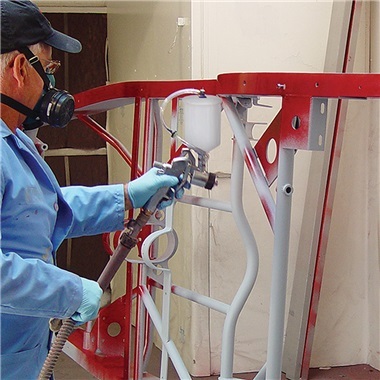 The increased pressure provides better paint atomization when spraying today's high solids, clears, hi-build primers, urethanes, and waterborne materials. The result is a smoother finish and less sanding prior to buffing. The SHOWTIME 99 will get the job done quickly, efficiently, and without all the overspray of conventional air compressor paint guns. This system will pay for itself within 1 to 2 paint jobs and while producing the BEST POSSIBLE FINISH on your classic car, street rod, tractor, or bike ... right in your own shop! 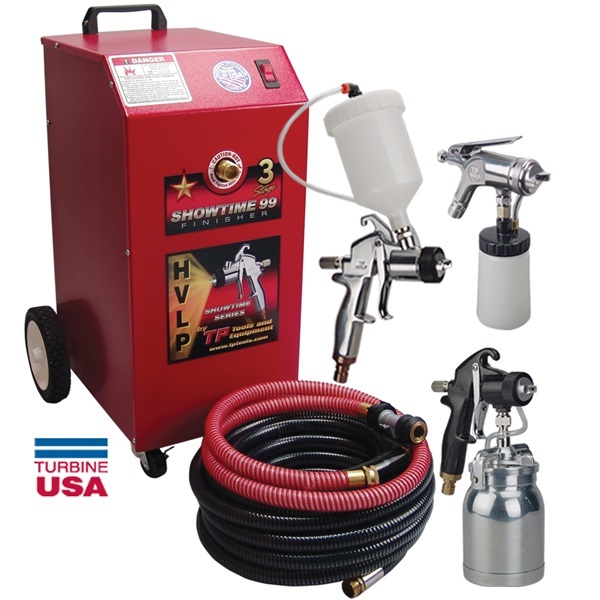 Model TP-99PLUS includes: Showtime 99 High-Volume 3-Stage Turbine Power Unit with 33 ft turbine hose, 5 ft flex hose with valve, TP Tools® ProLine 20-oz Gravity-Fed HVLP Finish Gun, TP Tools® ProLine 1-Qt HVLP Primer Gun, and TP Tools® ProLine 8-oz HVLP Touchup Spray Gun. SAVE UP TO 50% ON PAINT - 80% LESS OVERSPRAY! YOU DON'T NEED AN AIR COMPRESSOR TO PAINT. The HVLP difference - air is supplied at low pressure from the Turbine, instead of high pressure from your compressor. The result - reduced overspray and instant paint savings! Easy to use: Plug Showtime 99 Turbine Power Unit into 115 volt outlet, add paint to HVLP Gun (included), and start spraying! The Turbine Power Unit delivers an instant 60 cfm of air (high volume) at only 7.5 psi (low pressure). 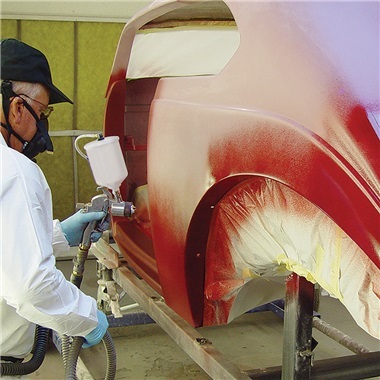 The high-volume air moves the paint, and the low pressure reduces overspray up to 80%. Sprays stains, enamels, lacquers, urethanes, basecoats, clears, pearls, primers, hi-build primers, and waterborne materials. Paint goes on smoothly with less mist and up to 50% paint savings. Also, the turbine warms the air so moisture is eliminated. Always dry, oil-free air to the paint gun. Warm air also helps paint dry faster, so runs and sags are eliminated! 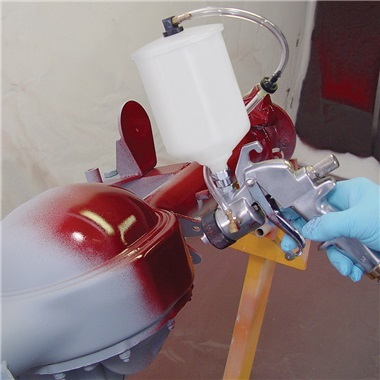 COST SAVINGS YOU WILL APPRECIATE ... You will quickly realize savings up to 50% in paint, clears, and reducers. Plus, less dirt and dust in your paint area, longer respirator life, cleaner floors, brighter lights, extended paint room filters, etc. All of this is possible because of less overspray - the paint goes on the vehicle, not in the air! The system pays for itself within 1 to 2 paint jobs! Expect trophy-winning results! TP Tools knows HVLP - over 25 years experience with HVLP equipment! WARNING - A respirator is required for use with this equipment (not included). See your safety supplier for proper protection. Up to 50% paint savings! Professional results in your own shop! 16"w, 18"d, 28"h. Dim. Ship Wt: 74 lbs. TP Tools® ProLine 20-oz Gravity-Fed HVLP Finish Gun is the heart of our Turbine Systems. Included with all Showtime HVLP Turbine Paint Spray Systems. Its rugged die-cast body features full-airflow design and floating air cap that adjusts from a 13" spray fan to the size of a dime. Has an adjustable air cap. Set cap to a 45° angle and the spray pattern becomes round. The round pattern saves material, especially when spraying a chassis, tubular supports, door jambs, trunk lips, and dashes. 20-oz gasketless plastic cup design saves money and no leaks! Has machined lid and cup to provide positive sealing. 1.0 mm gun sprays stains, enamels, lacquers, urethanes, basecoats, clears, and waterborne materials ... while saving up to 50% on materials! TP Tools® ProLine 1-Qt HVLP Primer Gun with 1.8 mm nozzle set sprays primers and hi-build primers fast and easy. The additional primer gun prevents material contamination in your finish gun. TP Tools® ProLine HVLP Touchup Gun with 1.0 mm nozzle set sprays most automotive colors and clears. Perfect for tight interior or small touch-up work! Compact design with 8-oz cup assembly comes in handy when painting door jambs, under the hood, or dash panels - anywhere a standard gun is too large. Floating aluminum air cap with adjustable spray pattern from the size of a pencil eraser to a 6" pattern. Easily connects to your existing turbine hose - just snap into quick coupler on hose and start spraying! NEW 3-Stage Turbine!A Great Way to Spray - Just Got BETTER! Produces 7.5 psi @ 60 cfm for Superior Finishes. YOU DON'T NEED AN AIR COMPRESSOR TO PAINT.The HVLP difference - air is supplied at low pressure from the Turbine, instead of high pressure from your compressor. The result - reduced overspray and instant paint savings! Just started using this machine, so far couldn't be more pleased. Lays paint down real nice. People at TP tools we're excellent to work with and the delivery time was unbelievable. I only just received the paint turbine; so as I begin to use it, as the weather warms, I will update. I gave it four stars based on delivery, appearance, packaging, and the apparent quality of the items. I have very little experience with automotive painting, I did extensive research as well as spoke to a number of people experienced in painting cars and concluded this system would work best for me. Eh, this may sound naive, but I am very excited about this, I have been saving money and planning for a couple years now and the timing was perfect as my son bought his first car at about the same time I bought this system and he and I are going to use his car as our 'test case'. Then I will paint my 'daily driver', a VW Jetta, then move on to my project, my 1970 Camaro. I guess you have to be a motor head to understand the excitement over painting a car....As the projects progress, I intend to post some pics and make updates, simply because there was so little information out there, maybe this will help someone else. Service & Delivery comments: I was called by TP customer service before delivery to confirm my location and to ensure delivery was done per my request, (left on the front porch). I appreciated their follow up and touching base with me. The package arrived as indicated, in perfect condition, well packed, and undamaged.